The committee formed by President Abdel-Fatah El-Sisi to review the cases of young people detained for “politically related crimes” will expand its scope to include prisoners who have received final verdicts in crimes involving protest, publishing and expression, Egypt's presidency said on Saturday. The review panel was previously only tasked with reviewing cases of defendants who had not received a final verdict from the courts. Committee member Karim El-Sakka confirmed to Ahram Online that 83 detainees will be released in the upcoming 48 hours. “The list [of pardons] includes 83 names, as a first batch, who should be released in 48 hours. More batches will follow, and the work of the committee will continue until the reviewing of the last batch,” El-Sakka said. 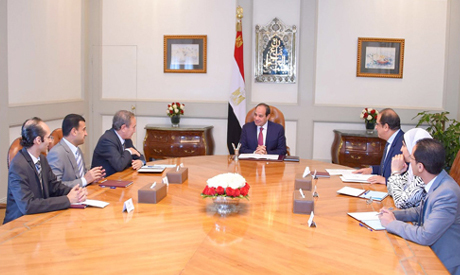 The panel was commissioned by El-Sisi during the National Youth Conference held in Sharm El-Sheikh in late October, and is tasked with reviewing the cases of young people held in detention for non-violent, political related crimes. According to the presidency's statement, the committee has been in communication with the National Council for Human Rights and the parliamentary human rights committee, as well as political parties, unions, rights organisations and the families of detainees. The committee is also coordinating with the interior and justice ministries. The five-member committee comprises prominent politician and member of the Free Egyptians Party Osama El-Ghazaly Harb, writer Nashwa El-Houfy, MP Tarek El-Kholy, National Council for Human Rights member Mohamed Abdel-Aziz, in addition to El-Sakka, a former member of President El-Sisi's electoral campaign. The president pardoned 100 prisoners in 2015, including dozens who were convicted of violating the controversial protest law during the 2013 Shura Council demonstrations and the 2014 Ittihadiya demonstrations. High profile individuals currently under precautionary detention include the founder of Belady foundation for street children Aya Hegazy, who holds both Egyptian and American citizenship and has been detained with her husband since May 2014, as well as Mahmoud Abou Zeid Shawkan, a photojournalist arrested in 2013 during the dispersal of the pro-Morsi sit-in at Rabaa El-Adawiya. Others detainees who have received final verdicts in cases related to expression and publishing include activists Alaa Abdel-Fattah, who received a five-year sentence in the 2013 Shura Council protest case; Ahmed Maher, who is serving a three-year sentence for violating the 2013 controversial protest law also in the Shura Council; novelist Ahmed Naji, who was sentenced in February to two years in prison for “violating public decency” for publishing a sexually explicit excerpt from his book in a literary magazine; and popular TV presenter Islam El-Beheiry, who is serving a one-year sentence on charges of blasphemy.